College is expensive, so picking the right degree is important. Check out this list of the highest-paid college graduates by school in Massachusetts. Despite its small size, Massachusetts is home to America’s smartest city — or at least the city with the most colleges per square mile in the country, Boston. There are several dozen Massachusetts colleges and universities included in PayScale’s College Salary Report. Some of the most notable include Harvard University; Boston College; Massachusetts Institute of Technology (MIT); Massachusetts College of Liberal Arts; and Massachusetts College of Art and Design. PayScale’s list includes several public schools and a number of private schools. Massachusetts’ most significant industries are considered to be: Life Sciences; Finance; Information Technology; Manufacturing; Renewable Energy; and Defense. Harvard and STEM powerhouse MIT are often right at the top of the highest-paid median mid-career alumni salary lists, with experienced Harvard and MIT grads earning well over $100,000. Of course, the Massachusetts Institute of Technology, where the majority of degrees granted are in science, technology, engineering or math subjects, still wins for early career salaries. Many of the best universities in Massachusetts are private schools. They are all relatively small as well — Harvard is the only school on the top 10 list that has more than 10,000 students. Massachusetts is also home to one of the best business schools in the United States. Babson College is a business-focused school where even students who don’t go on to earn an MBA report big earnings. Babson comes in third overall for median mid-career salary. Massachusetts is also home to more women’s colleges in PayScale’s list of best universities by earning potential than any other state. 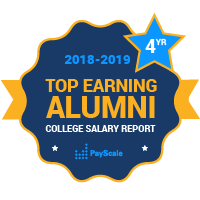 Wellesley alum report one of the highest earning potentials, followed by Simmons College, Mount Holyoke and Bay Path.